There was barely a cloud in the sky for my second walk in Upper Teesdale this year, following the same route as my excursion in early March. I spent most of the walk in shirtsleeves and, as I arrived at the top of Cauldron Snout, had clear views towards Cross Fell, the highest point in the Pennines. Widdybank Fell, the area around me, was a mosaic of heather moorland and closely-cropped grassland and, dotted around the grass were small flowers with a vivid deep-sapphire blue. These are the spring gentians, Gentiana verna, which appear for a few weeks in the spring time in Upper Teesdale. They belong to a group of plants called the “Teesdale rarities”, mostly species associated with arctic-alpine conditions which have survived in the unique environment of Upper Teesdale since glacial times. To find so many spring gentians in mid-May is a sign of just how cold it has been this year. I remembered, as I stood on Widdybank Fell, that I was in the same area almost exactly a year ago and there were virtually no gentians at all to be seen. 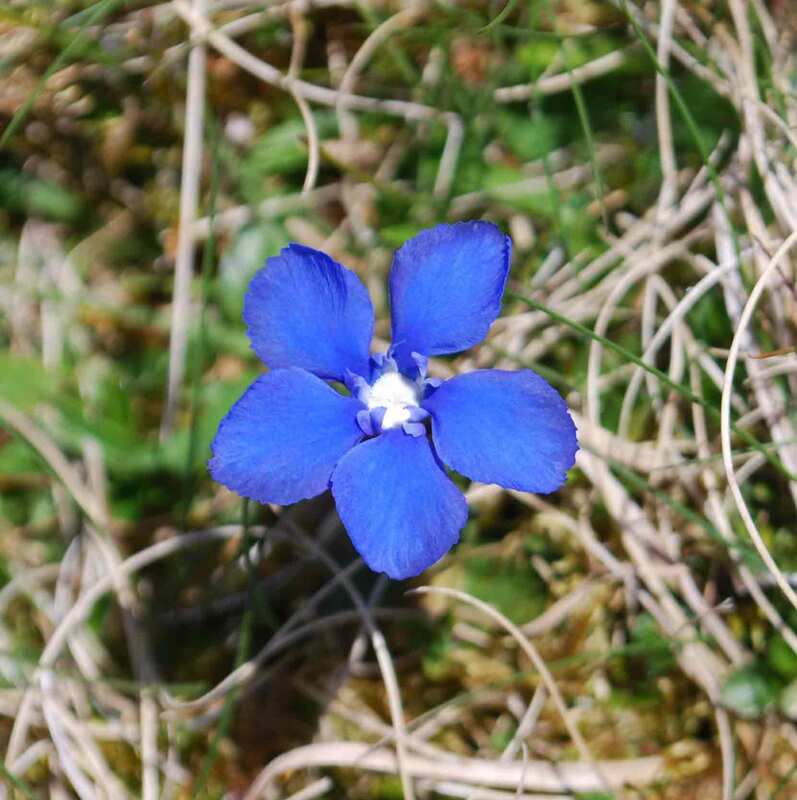 The Spring Gentian, Gentiana verna, photographed on Widdybank Fell, May 2013. But the spring gentians are a distraction today. My eyes were pulled towards the small stream. Red Sike, flowing off Widdybank Fell and into the Reservoir. The water was just a couple of centimetres deep, flowing across mostly limestone bedrock with just a few mobile pebbles The stream surface was freckled with tiny dark brown dots, which represent one more, albeit virtually unknown, addition to the intriguing flora of Upper Teesdale. Left hand picture: Red Sike, with Cow Green Reservoir in the distance, photographed in May 2013. Right hand picture: a pebble from Red Sike with dark-brown, hemispherical colonies of Rivularia. The usual approach to examining objects under the microscope is to have a very thin layer of the material, so that light can pass through it, and because the depth of field at high magnifications is very shallow. However, the little dots from Red Sike were resistant to this, refusing to be squashed under my cover slip. I had to tease out a few fragments with forceps and a needle in order to examine them. The reason was clear even at a relatively low magnification: I could see filaments of an alga all radiating out from a central point – that was what gave the colony its hemispherical shape – but, amidst the filaments were crystals of calcite. A superficial examination showed these filaments to be similar to those of the blue-green algae which we have already met, except this time the filaments gradually tapered to a narrow point. At the base of each filament was a cell with a different, more rounded, shape. This was the “heterocyst”, specialist cells responsible for nitrogen fixation. 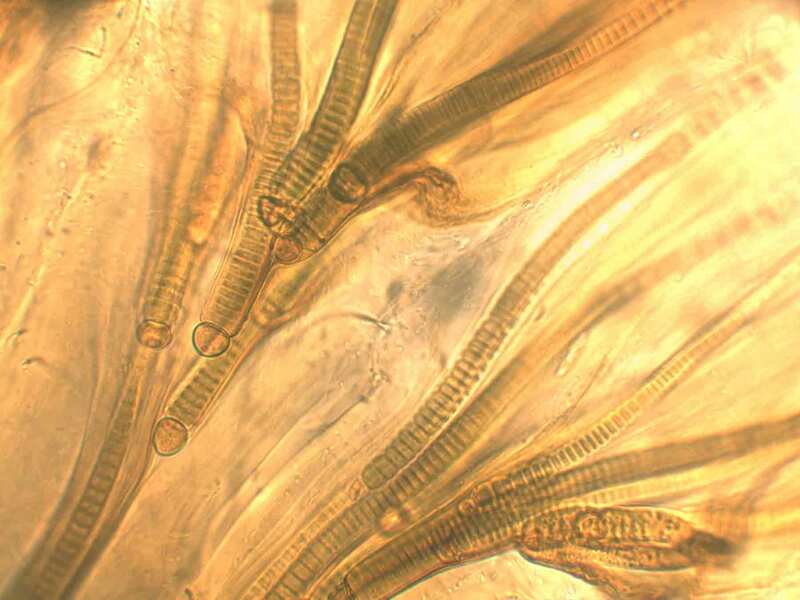 We saw these in the Tolypothrix filaments from the River Ehen (see post of 1 March 2013). Filaments of the blue-green alga Rivularia biasolettiana from Red Sike in Upper Teesdale. The base of each filament is about 10 micrometres (1/100th of a millimetre) across. Nitrogen fixation is an expensive process for any organism, as it requires a lot of energy. However, those organisms that can capture atmospheric nitrogen have a competitive advantage, especially in situations where nitrogen is naturally scarce. A few kilometres downstream, there will be just enough nitrogen leaching into the river from farming and other human activities for organisms such as Rivularia to lose this competitive advantage. Consequently, the presence of Rivularia in Upper Teesdale is a good indicator that this is a stream in its natural state, filled with organisms adapted to eking out an existence in a perpetually “hungry” state. Ironically, it is when man starts to “feed” rivers with nutrients and organic matter that the problems start.